WebSharing File/Media Sync might not sound too pretty to the ear, but it is the name of an app I would like to present to you today. In my opinion, WebSharing should've been called WiFi Sharing since that's what it was developed to do. Using WebSharing you can transfer files between your Android devices and a computer. No more tripping over cables! 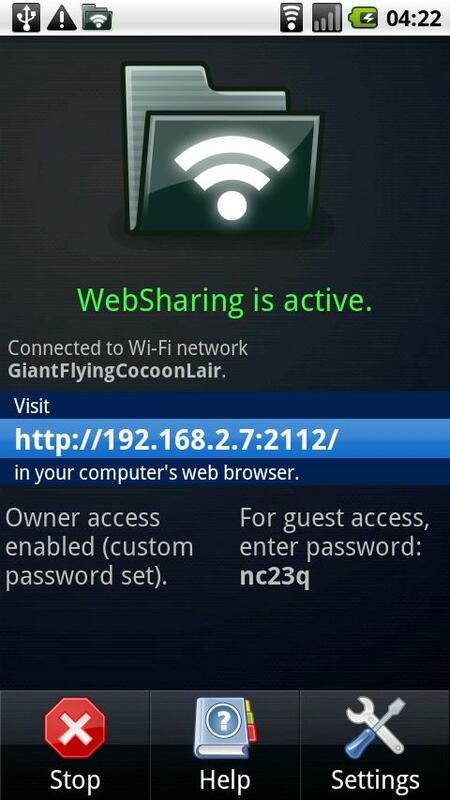 WebSharing let you transfer files over your WiFi. Not many apps are able to do this, which makes WebSharing that much more interesting. Files: Here you can navigate through your SD card’s folders. Music: You have the same sorting categories as on the Android Music Player. You can sort according to artist, album, all tracks, or playlists. Photos: You can organize your camera pictures, picture folders, and other pictures. Includes clear preview icons. Status: Remaining battery life, WiFi signal, memory card space, and processor capacity. You can browse through your folders under the “Files” tab by double-clicking. Once you’ve found the right folder, you can download the entire folder or a specific file by pressing the “File” button and selecting the necessary option. If you wish to download an entire folder, it automatically gets packed into a ZIP file. This might not be the best format, but it does get the job done. Uploading files is also done with the “Find” button. Have you ever streamed music from your phone onto your computer? No? Then it’s time you gave it a try! WebSharing makes it all really easy to do. Just open the music tab, browse through your music selection, and listen to tracks on your computer. I tested the streaming speed using a 54 Mbit Router and didn’t experience any problems whatsoever. The songs loaded very quickly and I could listen to tracks on my computer speakers. Another cool feature is the built-in picture viewer. You can access all of your pictures under the “Photos” tab. Just double-click on the picture viewer to get started. Unfortunately, there isn’t a built-in slideshow feature. That would’ve been a nice addition to this app. The status tab displays all of your Android phone’s basic information, including your battery life, wireless connection, free storage space, and processor capacity. In the settings, you can change your access password, activate guest access, and even activate a “cellular access” feature. I found the last feature to be particularly interesting. Activating this feature let’s you see your Android phone’s global IP address. I immediately entered this IP into my browser, but – alas- nothing happened. As said by the app’s developers, many providers have simply blocked this feature for their users. The guest access feature can be really useful if you’re sick and tired of the music being played while over at a friend’s house. You can connect your Android phone with a computer in a flash and start playing your own music. Awesome! If you’d like to move around some files between your phone and your computer, WebSharing is just what you’ve been looking for! Unfortunately, WebSharing is not well-suited for large file transfers. I would recommend sticking to your USB cable for larger data. The app itself could use a couple of extra features, like a slideshow function, for example. Using WebSharing is extremely unproblematic. The design is well-done on both the web browser and the Android. The tabs are understandably organized. Everything is in its right place. The download speed varies based on your particular router. Download and upload speeds should increase if your Android phone and router both support the n-Draft standard. Both the app and the web browser load quickly. Some lag time is unavoidable, especially with large pictures and streaming music. WebSharing File/Media Sync can be downloaded for $2,99 from the Android Market. WebSharing - the simplest, fast way to share in the network. Thanks for letting us know, Bill! Maybe we'll have to write up a review on ES soon. I haven't tried this app but having said that, ES (estrongs) file explorer allows you to transfer files between your phone & computer. It also has a built in ftp client. The difference is, it's free.